The Anolon Suregrip 35 x 32cm Roasting Pan makes roasting safer and more comfortable thanks to its Suregrip™ silicone enhanced handles that are slip-free and comfortable to the touch. It also features a non-stick rack with collapsible handles which stores easily, to allow the oil to drip while you are roasting your favourite meat and vegetables. The Anolon Suregrip 35 x 32cm Roasting Pan is oven safe to 260°C and features a non-stick surface for easy cleaning. The Euroline Electronic Scales is a handy tool to have in the kitchen. It features a large, easy to read digital display with metric or imperial measurements, and measures in 2 gram increments with a 5kg capacity. It also includes a clear acrylic square bowl for the ingredients you wish to measure. The Abode Aroma Cumulus Pod is a very clever little pod, utilizing “advanced water-based conversion technology” to create clean ribbons of aroma you can actually see. Indulge in its meditative swirls of scent or place it discreetly in any room for a whisper-quiet aromascape that is never overwhelming. The Abode Aroma Cumulus Cloud Pod has the heavenly ability to send you floating on Cloud 9 with just a few drops of your favourite Abode Aroma Cloud Pod oil fragrance. 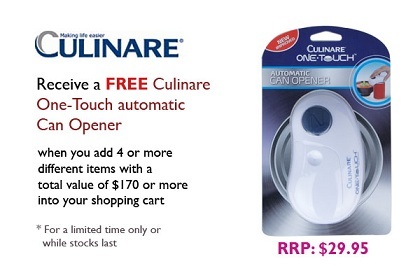 The easiest way to open a can is with a Culinare One-Touch Automatic Can Opener. At the press of a button, the can opener will automatically cut through the edges of the can, even the toughest cans. Press the button again to stop the automatic can opener. Bake a large square cake with the MasterClass Non-stick 30cm Square Cake Pan. A cool look for a warm night, the fresh green print on white cotton sateen design of theLinen House Night Garden Quilt Cover is embroidered with a wide border of intertwined leaves and flowers. The pattern is repeated in taupe and white on the European pillowcases and quilt cover reverse. Keep your spices organized and within easy reach with the S&P Soho 17pc Rotating Spice Rack. The spice rack rotates for quick and easy access to any spice during cooking, and will enhance the look of any kitchen.